Vancouver, British Columbia, June 18, 2018 — Burcon NutraScience Corporation (TSX: BU), a leader in natural product extraction, purification and isolation technologies, reported results for the year ended March 31, 2018. Completed a rights offering for gross proceeds of $3.5 million, with net proceeds of $3.4 million. Advanced discussions with certain multi-national food ingredient providers for a royalty or a joint operations agreement for Peazazz®. Burcon’s Winnipeg Technical Centre undertook Peazazz® applications work and provided significant quantities of samples throughout the year in response to requests from and in support of analytical work conducted by potential commercialization partners as well as for food and beverage companies who have expressed an interest in Peazazz® and Peazac®. 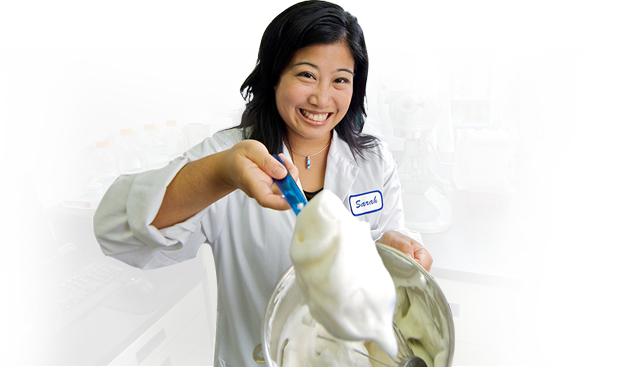 Received four U.S. patent grants during the fiscal year, including three for soy and one for the production of Peazazz®. The grant of the Peazazz® patent is the first to be granted for Burcon’s pea protein technology by the U.S. Patent and Trademark Office (“USPTO”). In addition, Burcon received a notice of allowance from the USPTO for a patent for the production of Peazazz® pea protein. The company’s patent portfolio comprises 247 issued patents in various countries, including 65 in the U.S., as well as more than 270 active patent applications, including 41 additional U.S. patent applications. Burcon filed for an accreditation license from Health Canada’s Office of Controlled Substances to conduct research for the future commercial production of purified cannabinoid extracts. If Burcon receives the license, it expects to apply its extensive experience in phytochemical extraction technologies to develop technologies for the production of highly-purified cannabis-derived compounds. Subsequent to the year-end, Burcon’s Peazazz® and Peazac® pea proteins received self-affirmed Generally Recognized As Safe (“GRAS”) status and the Company has submitted to the United States Food and Drug Administration (“FDA”) a formal GRAS Notification dossier. During fiscal 2018, ADM has been actively engaged with a number of existing CLARISOY® customers, as well as numerous potential CLARISOY® customers, at various stages of the typical protocol food and beverage companies utilize when investigating and adopting a novel new ingredient for use in their food and beverage products. Unique to any other proteins on the market, ADM’s CLARISOY® line of soy proteins comprise the world’s only vegetable-based proteins that offer exceptionally high solubility, clean flavor and complete protein nutrition. ADM’s current CLARISOY® product portfolio includes: CLARISOY® 150; CLARISOY® 170: and CLARISOY® 180, and this product line is well-positioned to help beverage manufacturers meet the ever-growing demand from health and wellness-minded consumers for great-tasting, nutritionally enhanced beverages with natural ingredients and clean labels. Among the variations of CLARISOY® that ADM has developed, ADM is currently focusing on marketing CLARISOY® as an economical, high-quality plant-based dairy alternative that provides greater cost stability and comparable nutrition. ADM’s team has developed and demonstrated products to showcase CLARISOY®’s ability to deliver reliable performance in a wide range of applications, including fortifying vegan applications with a dairy-free protein source without compromising taste. Also, during fiscal 2018, Burcon continued its efforts toward commercializing its other unique plant protein extraction technologies. Burcon has focused in particular on working with a select group of potential partners for the commercialization of our Peazazz® pea protein. Burcon’s team at the Winnipeg Technical Centre continues to support these ongoing discussions with: due diligence visits; applications work on potential consumer products; and sample production, both for the potential partners as well as for food and beverage companies who have expressed an interest in Peazazz® and Peazac®. The potential partners’ activities have included market analyses, product applications work and a detailed investigation of the logistics and economics associated with: building; commissioning; and operating a commercial protein production facility. During the year, Burcon was granted a U.S. patent, covering technology for the production of its Peazazz® pea protein: U.S. patent no. 9,635,875, which was granted on May 2, 2017. This patent is important and represents the first patent to be granted for Burcon’s pea technology by the U.S. Patent and Trademark Office and confirms that our approach is unique, distinct and defensible. In addition, Burcon received a notice of allowance from the USPTO for a patent for the production of Peazazz® pea protein. A notice of allowance from the USPTO is a written notification that a patent application has cleared internal review, is pending issuance and will grant in the near future. Burcon has a number of additional pea protein patent applications and we are confident that, in due course, we will be granted additional patents. Since the beginning of fiscal 2018, Burcon has been granted three U.S. patents covering technologies for the production of CLARISOY®. These patent grants and allowances bring the company’s patent portfolio to 247 issued patents in various countries, including 65 in the U.S., as well as more than 270 active patent applications, including 41 additional U.S. patent applications. Subsequent to the year-end, Burcon’s Peazazz® and Peazac® pea proteins received self-affirmed GRAS status and the Company has submitted to the FDA a formal GRAS Notification dossier. Obtaining GRAS status is important for the acceptance and use of these proteins ingredients by leading food and beverage companies. GRAS status removes regulatory barriers for food innovators, ingredient buyers, and mass-market food service buyers to use Burcon’s Peazazz® and Peazac® pea proteins in their product offerings. Revenues totaled $49,000 for the year, as compared to $88,000 in the same year-ago period. 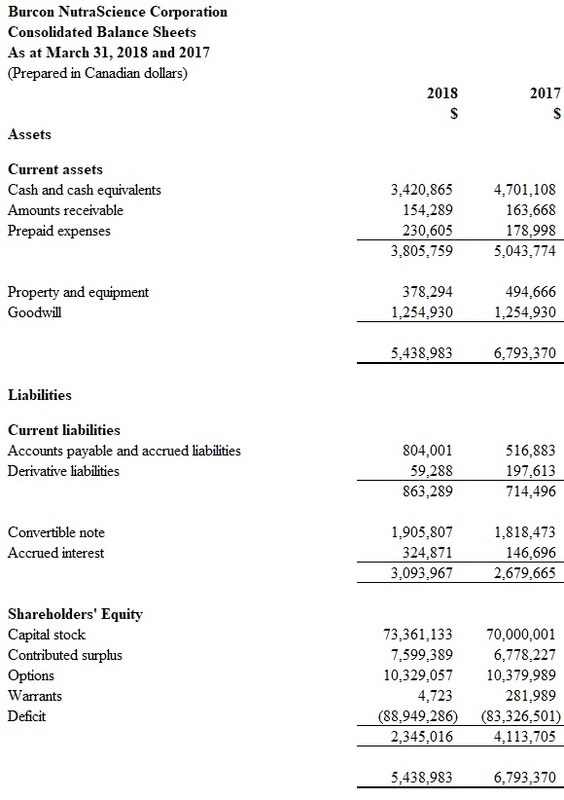 Prior year’s revenues included the recognition of $39,000 in deferred revenues. The nominal revenues reflect the company’s development phase status as it transitions to the commercial stage. 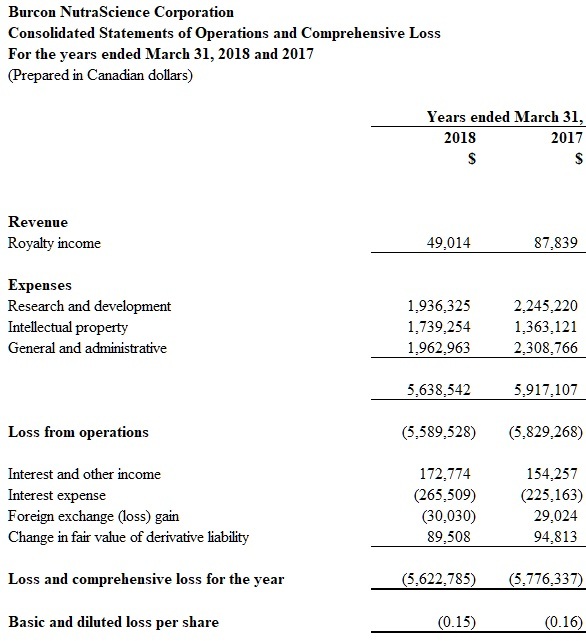 Net loss totaled $5.6 million or $0.15 per basic and diluted share for fiscal 2018, as compared to a net loss of $5.8 million or $0.16 per basic and diluted share in fiscal 2017. Research and development expenses totaled $1.9 million for the year, as compared to $2.2 million in fiscal 2017. Most of the decrease is due to deferred development costs being fully amortized during fiscal 2017. Lower salaries expenses from the termination of an employee during the year also contributed to the decrease. Intellectual property expenses increased to $1.7 million in fiscal 2018 from $1.4 million in fiscal 2017. The increase is due mainly to higher maintenance fees for the soy and canola portfolios due the patent prosecution activities being temporarily suspended during the fiscal 2017 financing period. In addition, we incurred higher European registration fees this year from two soy patent applications that were granted in Europe. General and administrative expenses decreased to $2.0 million in fiscal 2018 from $2.3 million in the fiscal 2017. The decrease is mostly attributed to decreases in stock based compensation and non-cash financing expenses. During the year, Burcon completed a rights offering that provided gross proceeds of $3.5 million, with net proceeds of $3.4 million. At March 31, 2018, cash balances totaled $3.4 million compared to $4.7 million at March 31, 2017. Management believes it has sufficient resources to fund its expected level of operations and working capital requirements to October 2018. This estimate does not take into account potential proceeds from outstanding convertible securities or royalty revenues from the sale of CLARISOY®. The company’s complete financial statements, along with management’s more detailed discussion and analysis, are available from the company’s Investors section at www.burcon.ca or from www.sedar.com. Burcon NutraScience is a leader in developing functionally and nutritionally valuable plant- based proteins. The company has developed a portfolio of composition, application, and process patents originating from a core protein extraction and purification technology. Burcon’s CLARISOY® soy protein offers clarity and high-quality protein nutrition for low pH beverage systems and excellent solubility and exceptionally clean flavor at any pH; Peazazz® is a uniquely soluble and clean-tasting pea protein; and Puratein®, Supertein® and Nutratein® are canola protein isolates with unique functional and nutritional attributes. For more information about the company, visit www.burcon.ca.